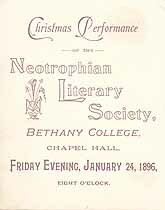 Christmas Performance of the Neotrophian Literary Society, Bethany College, Chapel Hall, Friday Evening, January 24, 1896, Eight O'Clock. Names in this online transcription include Clopper, Colyer, Curtis, Gilmore, Hostetter, Lutton, Merryman, Place, Sommerville, Stewart, Stickley, Watson, White, Willett. The Genealogy Today catalog number for this item is 16218. When inquiring about the information in this resource, please mention the catalog number.